Athletes participating in wrestling, jiu jitsu or any other grappling based martial arts should be aware that continuous trauma to the ear will increase the likelihood that the skin peels apart from the ear’s cartilage. This occurrence will cause the impacted area to swell with blood. If not taken care of promptly and carefully, the grappler’s ear will deform and become what is commonly known as cauliflower ear. Therefore, wrestlers are typically seen sparring with protective ear guards to prevent these incidences from happening. 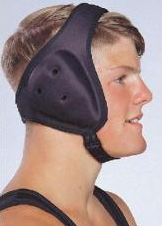 The following content will review a protective ear guard named the Matman Ultra Soft Wrestling Headgear. I originally bought my Matman headgear to prevent my fresh cauliflower ear from getting worse as I continue to train jiu jitsu. The content of this Matman review will be based on my personal experience. Color Options: Black, gold, red, royal blue, navy blue, purple, green and brown. The availability of these color options vary between sellers. Earpiece: The Matman headgear incorporates a tough plastic cup to cover the user’s ears. Each of these cups have three holes for airflow and to increase the ability to hear with them on. Fabric: Soft fabric covers both the interior and exterior portions of the headgear. Head Straps: One adjustable strap is located behind your head and the other adjustable strap connects over the top of your head. Both of these straps are made of neoprene or a similar material. Furthermore, part of these straps have Velcro to secure itself in place after you adjust them to their ideal position. Chin Strap: The chin strap is simply composed from tough nylon and uses Velcro as well. The material and low profile design used to create the Matman headgear gives it a overall light weight relative to alternative options that are bulkier and made with plastic components. With multiple adjustment points, the headgear should be able to adjust to any head size as long as you make sure you are correctly choosing between the youth and adult model. Example of the Matman headgear being worn. The soft material used for the head straps and the earpieces feels more comfortable and not as noticeable over time. As soon as you adjust the head straps to the ideal position for yourself, you do not have to worry about touching and fixing them again in the future. Typically, grapplers that do not wear ear guards during sparring will not enjoy the abrasions and impacts felt from their train partner’s ear guards that have a plastic exterior. Therefore, the soft fabric is preferred for your teammates’ sake as well. I have noticed that my ears do heat up during prolonged uses and the surrounding sounds are slightly muffled with the Matman headgear. Due to this, I wait until the sparring portion of class to throw them on. You do need to tighten the chin strap down a bit to prevent these ear guards from shifting. The chin strap is easily the most uncomfortable portion of the headgear. Having a bare nylon digging into your neck is not a fun experience. Consequently, tucking your chin to protect your neck in submission grappling scenarios can be annoying and painful. Therefore, you have to find the balance on the tightness of the chin strap so that it prevents the headgear from shifting and does not dig into your neck too uncomfortably as you roll. 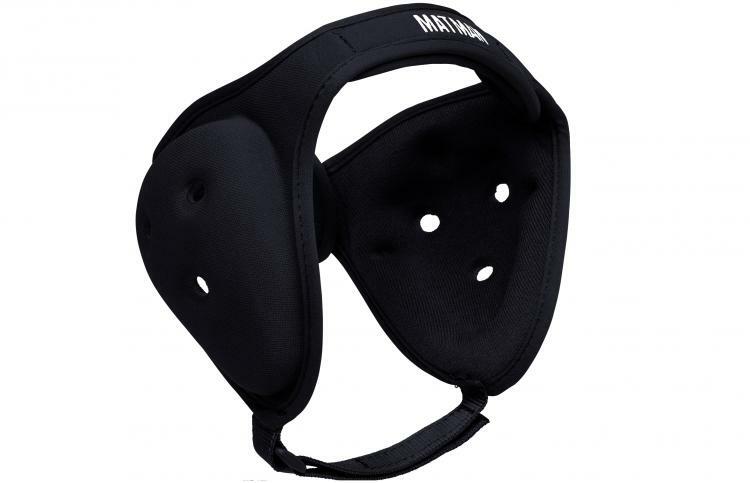 It would be great if the company Matman had integrated a throat pad component for additional cushion and a larger surface to distribute the pressure on your neck. Each Velcro portion of my Matman headgear is still strong and sticky. They have not gone undone during my sparring sessions. The durability of the Matman ear pieces may not be as great as other wrestling headgears with hard plastic exteriors, but they are holding up well so far. The material used to create the Matman headgear allows it to be machine washable. Hand washing it is more recommended though. If you do plan to throw it in the washer, make sure the velcro pieces have no exposed area. Otherwise, you will be putting your other clothes at risk for getting damaged. Hang drying it after washing is ideal, but changing the dryer setting to air dry would most likely work as well. I tossed my headgear in the dryer with all my other clothes and noticed that the chin strap velcro section start deforming over time and obtaining a curly appearance. As a result, I would recommend not drying it with any setting other than air dry if you want to be careful. On the other hand, the curly velcro feature still allows the chin strap to securely stay in place. Grapplers with sensitive ears will normally wear ear guards as a preventative measure against obtaining cauliflower ears. After my cauliflower fully healed, or should I say hardened, I will only wear the headgear if I start noticing the symptoms developing. The Matman did a good job of protecting my ears once I found the chin strap’s tightness that worked for me best. If you plan to use a headgear right after a fresh ear drainage or recovering from a cauliflower hardening, I would suggest using some type of small ear clamp underneath the Matman headgear to keep tight pressure on the detached skin area. Plus, if the headgear does move and roll over your fresh cauliflower ear, the clamp will limit the stress and stretching that may occur on the sensitive location. I used a plastic material that was molded to pinch the front and back of the affected region of my ear. If you are serious about taking your grappling game to the next level and not worry about cauliflower ear, I highly suggest getting this.